The morning after the bloom, a bee visits the Tina James Magic Primrose. Our Tina James Magic Primrose plants have been putting on quite a show for the past few weeks at dusk in the Vegetable Garden and behind the Painting Studio. The tightly wound yellow blooms dramatically open as night falls (around 9 p.m.). Before the show starts, visitors walk around the plant to see if they can guess which bloom will lead be the leading note of the overture. Excitement and anticipation is high and it is easy to feel giddy, like a little kid again. 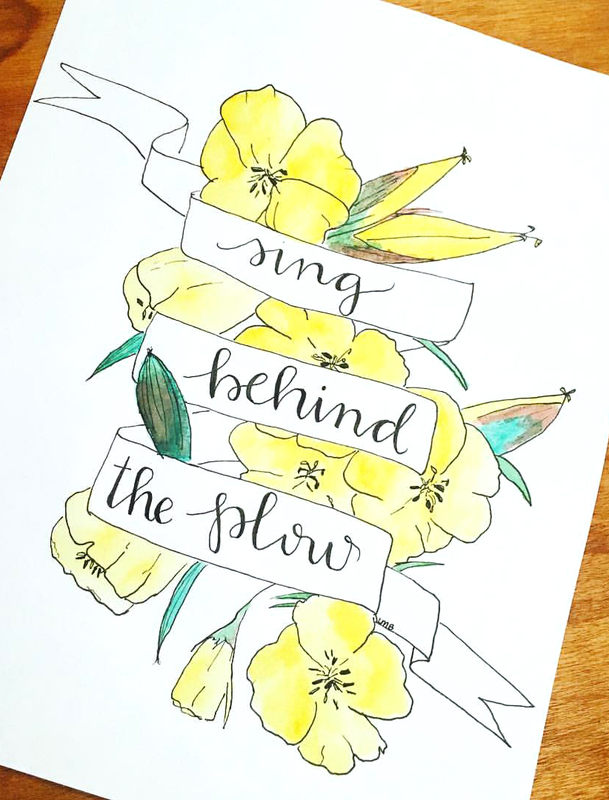 The sepals (the green outside of the flower) peel down the flower and the tightly wound yellow trumpet begins to relax and open. Within seconds, before your very eyes, the blossom opens fully and settles into a large bright yellow flower with a delicate, sweet smell. It’s is like watching time-elapsed photography in real time; it’s just incredible. 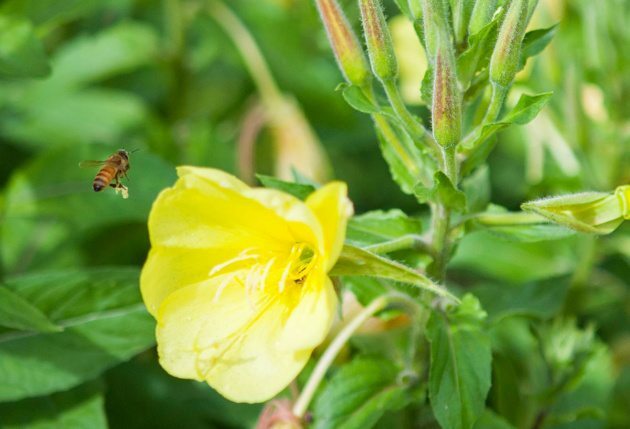 Each bloom only lasts through the night until mid-morning of the next day, attracting pollinators like bumble bees and butterflies during the morning and large humming bird-sized lunar moths at night. Instructor Lisa Bruno was inspired by our Evening Primroses to create this beautiful hand lettering and watercolor piece. 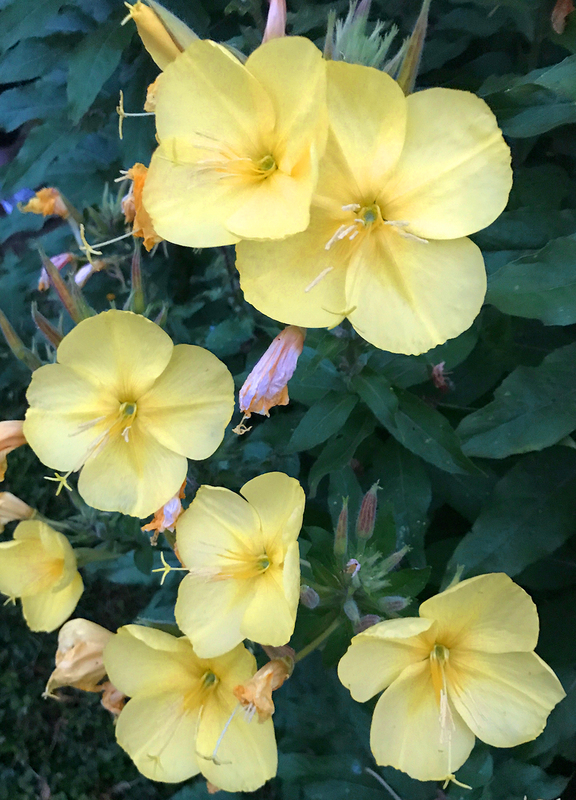 Evening primrose is known to attract fairies, it is widely known that the fairy folk collect dew from the blooms to make potions. The flowers represent fickleness in the Victorian language of flowers, perhaps this has to do with there tendency to change shape so often. 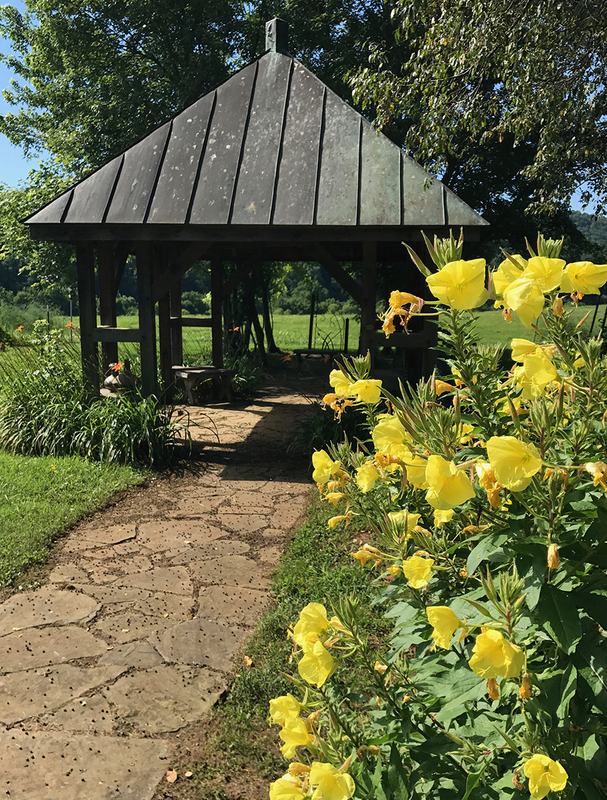 You can find one of the bushes next to the gazebo in our main vegetable garden. Produces large fragrant blooms. At dusk, they suddenly burst open displaying crisp, yellow, showy four-petalled flowers. The flowers circle a spire of reddish, swollen buds. Blooms are 2/3 open within 10 seconds or less, and fully open within 1 to 2 minutes! Blooming lasts five to six weeks or more. Produces a flat rosette of leaves the first year, followed by 3 to 4′ yellow spires the second year. Very hardy. 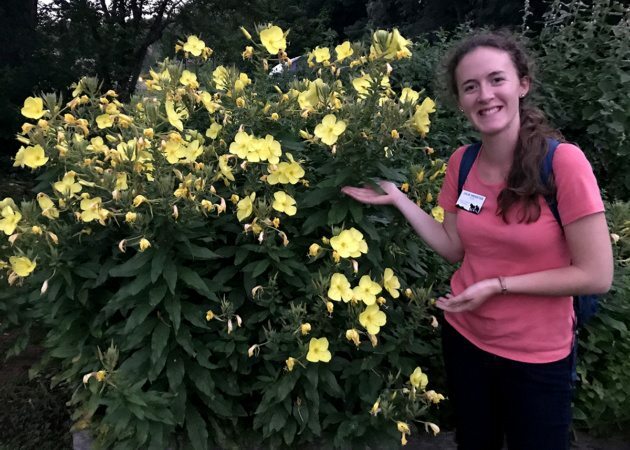 During the evening the flowers are pollinated by night-flying moths as large as hummingbirds. This variety was discovered by garden writer Tina James who hosts “primrose parties” every year. The whole plant is edible–flowers make an especially nice salad garnish, the leaves can be cooked as greens, and the roots can be boiled and eaten. Evening Primroses (pictured in the background) aren’t the only beautiful flowers you will find in our garden. 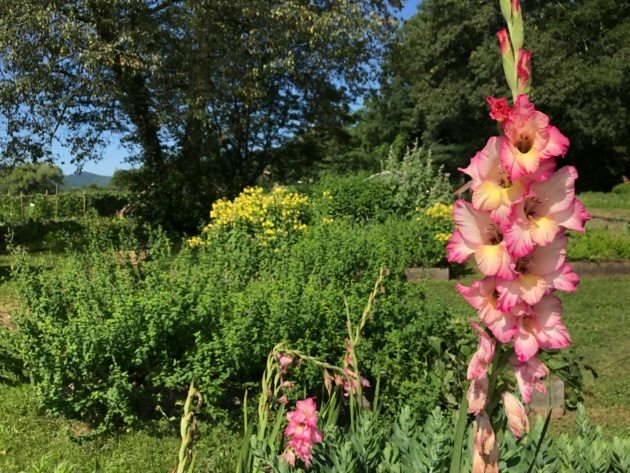 Don’t miss this impressive floral show at the Folk School, now blooming (until supplies last: about 1 more week), every evening around 9 p.m. in two of the box beds in the center of the garden, across from the bench below the herb garden gazebo, and in the back of the Painting Studio.